The New Reads Book Club focuses on contemporary literature and is hosted by Drawn and Quarterly staff members. The book club meetings take place every 4-6 weeks, and are open to all. For our next meeting, on Wednesday, June 20th, we will meet at La Petite Librairie Drawn & Quarterly (176 Bernard O.) at 7 pm to discuss The White Book by Han Kang. The evening will be hosted by Librairie D+Q staffer Benjamin. Join us for discussion and drinks! From the author of The Vegetarian and Human Acts comes a book like no other. The White Book is a meditation on colour, beginning with a list of white things. It is a book about mourning, rebirth and the tenacity of the human spirit. It is a stunning investigation of the fragility, beauty and strangeness of life. Translated from the Korean by Deborah Smith. A big thank you to Alexander Chee for joining us last week, for the launch of How to Write an Autobiographical Novel (in stores now!). And a big thank you to Guernica co-editor Hillary Brenhouse for being in conversation. The two had such an interesting talk, much to the delight of our packed house. Of his transition into essay writing, Chee located it in the writing process of his novel. “When I would be stuck with the novel, I would work on an essay. And it was a way of just feeling like I wasn’t... spinning” he said. On the topic of astrological readings, Chee read from an apt section of How to Write an Autobiographical Novel—the chapter titled, “The Querent” referring to one who seeks questions in their readings. Thank you Alexander Chee & Hillary Brenhouse! Each month we host a Graphic Novel Book Club meeting, open to all, during which we hang out and informally discuss a featured graphic novel. Our pick for this May is The End of the F***ing World by Charles Forsman. We will meet at La Petite Librairie Drawn & Quarterly (176 Rue Bernard O.) on Wednesday, May 16th at 7 p.m. The discussion will be hosted by Librairie Drawn & Quarterly staff member Sophie Croteau. Join us for refreshments and collective insights! The End of the F***ing World, recently adapted into a Netflix TV series, was originally published in 2011 by two-time Ignatz Award-winner Charles Forsman. It follows two tortured adolescents through a disturbingly dark road trip, where outbursts of violence will plunge them into deep questions of identity and relationships. Carefully minimalist, Forsman’s book centers around the emptiness of horror, trapping the reader in the stillness of it, and forcing us to contemplate its humanity. Top 5: April's bestselling cookbooks! Join us at la Petite Librairie Drawn & Quarterly for our young adult book club, hosted by Georgina Devlin for kids ages 11-14. Pizza will be served. 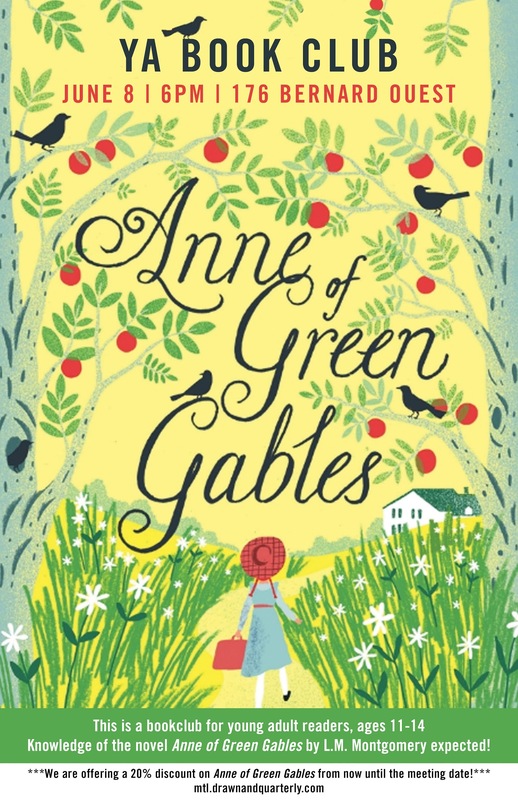 Knowledge of the novel Anne of Green Gables by L.M. Montgomery expected! No olds, please. Please note we do not have enough room to host parents and kids, and we are happy to chaperone kids ages 11-14 without their parents. This is a bookclub for young adult readers, ages 11-14. There will be a different book every meeting. The focus is allowing tweens a safe space to learn to discuss and express thoughts and ideas about literature among peers. Please, no kids younger than 11, thank you. Each month, Librairie Drawn & Quarterly invites an author or artist to curate a shelf in the store. This May, we bring you recommendations from Sheila Heti! We are thrilled to be hosting Heti for the launch of Motherhood, Thrusday, May 3rd! Tickets are available online or in-store. One of my favourite things about this book is its depiction of being a woman artist in the 1960s when writing and drawing autobiographically felt like such a radical and abject thing to do. Aline Crumb is sparkling, hilarious, and brilliant observer of the world she finds herself in. It simultaneously feels super-contemporary and also like you’re time travelling. This is a terrific non-fiction book that has permanently changed how I think about millenials and the situation they find themselves in. It’s Marxist, despairing, angry and condemning—and the picture he presents is very frightening. But I loved reading it, and think it has one of the best endings to a book of social woe. I think it’s required reading. Even if you are put off by a book about drugs (you are??) you should find this book interesting for the questions Tao poses about the nature of reality, and for his profile of the fascinating countercultural figure, Terence McKenna. I think it’s Tao Lin’s best book. Smart, sensitive and thoughtful, you’ll come out of it knowing and feeling more. I read this book when I lived in Montreal many years ago, and it is so twinned in my mind with the experiences of being in this city. The book is about living in Montreal—an artist, poverty-stricken, a romantic, a degenerate. It is alive and funny and it’s impossible to read it without also feeling like you’re living it. If you like literary gossip, buy this book. If you’re interested in the twisty, roundabout ways art gets made—particularly all the wrong turns, dead ends, and embarrassing pomposities—buy this book. If you want to see Flaubert’s friends shaking their heads at him in pity at his bad writing, you should definitely buy this book. When asked to recommend books, I always recommed this one. I read it in my early twenties and it forever made me think about style and narrative differently. It’s so unique, from the sentences to the characters to the plot, and absolutely unforgettable. A strange and perfect world, and the only novel Jane Bowles ever wrote. I hate to write something like “If Sylvia Plath wrote an illness memoir, it would be this book,” but that pretty much sums it up. This book is spare, vivid, epigrammatic and intense. After lending it to a friend, I finally got it back after five years. Few books have moved me more profoundly than this one. I spent years avoiding Thomas Hardy, somehow imagining—simply because of his name!—that his books were not for me. After reading Jude the Obscure I went out and bought all the rest of his books. Is the most wonderful novelist in the English language of all time? Maybe so. Okay, I’m in this book. I was even commissioned to write a screenplay of it! (But failed). It’s still one of the most uniquely told love stories I have ever encountered. I love how the book asks you to read in a new way. In all her books, she does amazing and new things in the intersection of words and images. This is one of my favourite books of all time. It’s about faith and temptation away from faith, and even if you aren’t interested in religion or Christianity or God, there is lots in it about the nature of desire, and the difficulty of resisting desire. I really love this book. I buy copies of it and give it to friends. It’s really funny, too.